OSWEGO – The Pregnancy Care Center of Oswego County welcomes you to join them for the first 5K Walk/Run for Life. All the fun will be taking place at Breitbeck park in Oswego, on September 25. Registration begins at 5 p.m. with the race beginning at 6:15 p.m. Registration is $25 per person and includes a chicken BBQ dinner and a Protect Life T-shirt. Along with the 5k there will be the Great Baby Race at 5:30 p.m. 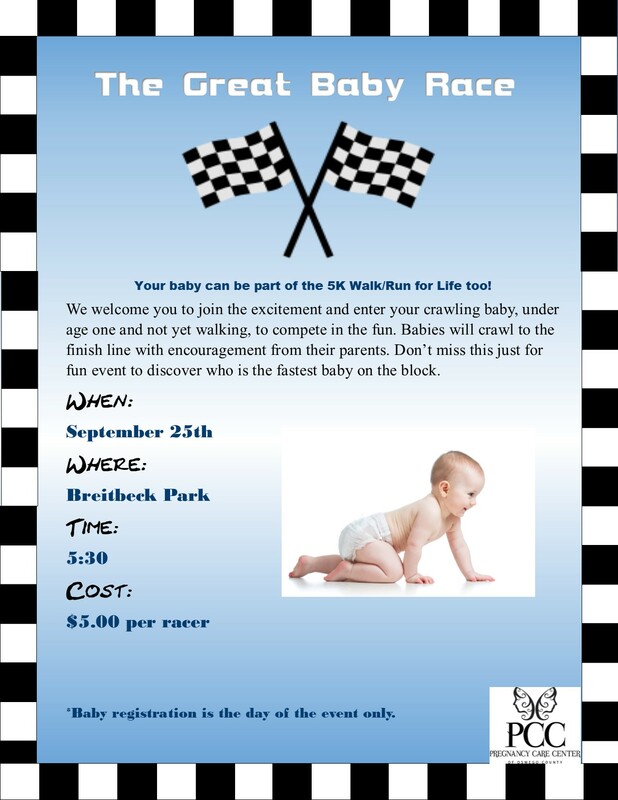 The Great Baby Race is an event just for your crawling baby, under age one and not yet walking, to compete in the fun. Cost for each baby racer is $5 and registration for the baby race is the day of the event. Babies will crawl to the finish line with encouragement from their parents. BBQ dinner tickets will be sold the day of for non-racers. Visit our website or give us a call to register. www.oswegopregnancy.org/events or 315-343-4866. The Pregnancy Care Center of Oswego is a 31-year-old non-profit serving women, babies and families through peer counseling, free pregnancy tests and material resources. The Pregnancy Center is located at 157 Liberty St., directly across from Oswego High School.